Trion High School Athletic Director Jason Lanham walks and talks about the possibility of a police presence on site at the school where a maintenance facility stands. "We would repurpose some of this building and use a new emergency entrance that has been cut in already," Lanham said. TRION, Ga. — What's tougher than putting a police officer on campus? Putting all your police officers on campus. Trion City Schools Superintendent Phil Williams and Police Chief Jason Kellett have solicited a proposal from an architectural firm to build a new police station on the grounds of the school system. Both believe the concept would make the campus safer and could be cheaper than staffing the halls with extra school resource officers. The school system is smaller than — and different from — most. 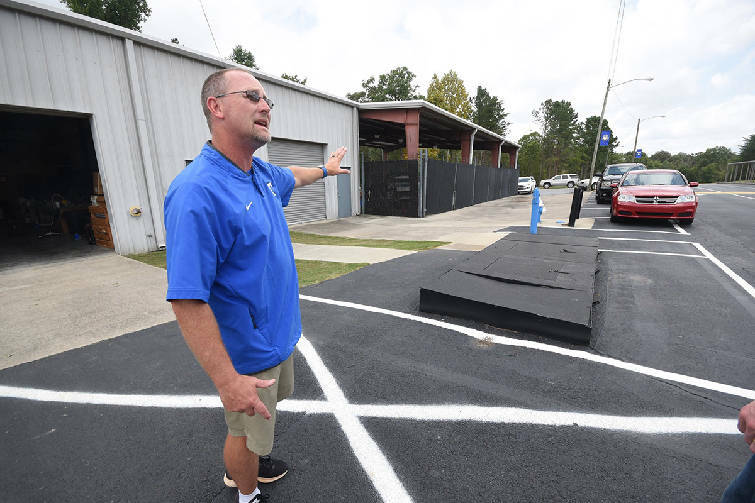 Standing next to what used to be a covered bus parking site, Trion High School maintenance director Jimmy Prince talks about the possibility of a police presence on site at the school where a maintenance facility stands. The 1,400 students all attend classes on one property, located on a hill at 919 Allgood St., about a mile east of the building that currently houses Trion's town hall and the police department. Students go to elementary school in one building, middle school in a building behind that and high school in a third building behind the first two. Unlike in most cities and counties, the law enforcement agency would be next to all of the community's students at once. Williams believes the district could build a police station in the system's old bus barn, next to the schools. Footage from the buildings' security cameras would stream right to the officers. "We're trying to do things we feel would help keep our kids the safest possible," Williams said. "If there were an incident, they would be 10 seconds away and have full information on what is occurring, where it's occurring," Mayor Larry Stansell added. "There are a lot of benefits." But the plan requires approval from both the board of education and the council. And while some school board members are excited about the idea, members of the council were more hesitant when talking to the Times Free Press last week. This is a small town, with about 2,300 people living within 4 square miles. The council's entire general fund budget is $3.6 million. Any expense is a big deal. Councilman Don Harris said Kellett and Williams presented a slideshow earlier this year, outlining what the new police station would look like. But their proposal didn't answer the most important question: How much money do they need? "The design," he said, "that's fine. But we need to know the cost." "It would be appropriate to call it in the think tank for future planning and not a high priority at this time," Town Attorney Albert Palmour said in an email. "If grant funds became available it might move the needle." Trion High School Athletic Director Jason Lanham talks about the possibility of a police presence on site at the school where a maintenance facility stands. "We would repurpose some of this building and use a new emergency entrance that has been cut in already," Lanham said. Discussions about funding between the two groups is tricky. Unlike in most Georgia districts, Trion's school board does not have taxing authority. It is like Hamilton County in that respect, depending on the local government for some funding. Under the budget passed last week, the district receives about $1 million from the town council — about 8 percent of its total revenue. So if the school board says it will pay for the construction itself, that's not entirely true. In theory, it can use funds it receives from the state. But whatever money it uses on the police department is money it can't use on another project — a project for which it would then need that local funding. As an example, Williams is interested in drawing from the district's $1 million reserve fund to build the police department. He's hoping the estimate for the building will be about $300,000, so there's plenty of money in the fund to cover the expense. But he doesn't know if he can use the capital fund for a police department. He is waiting for an answer from the Georgia Department of Education. And even if the board can use money that way, Williams concedes other capital projects would slide down the list of priorities. Built in 1996, the schools need new roofs. And the football team needs a bigger field house. And the HVAC system is old. "I don't know if it's really going to happen," he said. "In my opinion, it's a really good idea. It would serve our community and schools well." At the same time, a new police department may be cheaper in the long run. The town currently funds one school resource officer at about $34,000 a year, Kellett said. While the campus is relatively small, parents may want an additional officer there, as fears about mass shootings in schools have become a common thread across the country. If they moved the department on campus, they wouldn't need to hire another officer. Even officers on the road would frequently come to campus because they don't have computers in their cars. They have to write every report from the office. (Including the chief, Stansell said, the department has eight officers.) Kellett does not know of any other agencies that do that, except for campus police in colleges and universities. Conversations about the plan heated up after February's deadly school shooting in Parkland, Florida, said school board member Darriel Broome. No federal government agency tracks the number of school shootings across the country. But reporters with the Washington Post maintain a database and estimate that 215,000 students at 217 schools in the United States have experienced gun violence since 1999. The number includes shootings at nine schools in Georgia — most recently in February, when a Dalton High School teacher fired a shot through a window in his empty classroom. This year, school districts across North Georgia have hired more officers for their campuses. Catoosa County hired five more school resource officers for about $200,000. Walker County hired three more. Dade County hired two more. While working closely with Williams on the proposal, Kellett is not sure if even he supports relocating the department. "I don't know if it's the best idea," he said. "I don't know if it's the worst idea. It's hard to say what's going to be the best thing." He pointed out that districts are looking at other options for school security, in addition to school resource officers. Some are funding high-tech communications systems. Others want to let teachers carry their guns into their classrooms. Others want to focus on "engaging" students so they feel comfortable reporting problems to staff before they escalate. Like everyone else in town, Kellett wants to know how much construction will cost. He said he also wants to know something else: What are the odds a mass shooting hits Trion? For both questions, he concedes, it's hard to say what's appropriate. "I don't know how you put a price tag on a project like that," he said. "I just don't know." Contact staff writer Tyler Jett at 423-757-6476 or at tjett@timesfreepress.com. Follow him on Twitter @LetsJett.